FalconRED™ combines the most efficient envelope opening and extraction unit on the market, the OPEX Model 72 ™ Rapid Extraction Desk, with OPEX’s latest high-volume production scanning technology. FalconRED is designed to attack the most difficult and daunting of digital mail center workflow challenges. FalconRED allows operators to open, prep, and scan the contents of envelopes all on a single platform, and at significantly faster rates than can be achieved using current multi-step processes. This substantially increases the integrity and security of the documents being processed while at the same time greatly reducing the costs associated with preparing documents for scanning. 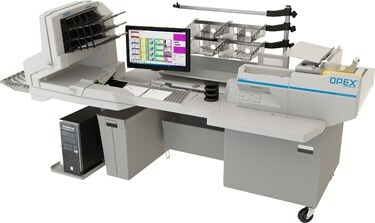 In addition, FalconRED offers four versatile document feeding capabilities: drop-feeder, packet feeder, high-capacity feeder, and a unique Rescan Feeder. FalconRED can handle a wide range of intermixed envelope sizes and thicknesses. Simply load mail onto the mail extraction desk, pull the extracted documents out of the envelopes, and drop them onto the conveyor. It can process everything from checks and single sheets to multiple stacks of documents. From thick paper to onion skin and fragile or damaged pieces, from envelopes and file folders to receipts, to small forms and business cards – nearly any style or type of document can be scanned! With the optional external capture device and software, three dimensional objects can be imaged and placed directly into the electronic record.